The Connecticut State Police Academy Alumni Educational Foundation, Inc. seeks to provide deserving students - the son/daughter or grandson/granddaughter of a CSPAAA member in good standing for at least two (2) years who meets the criteria - with the opportunity to pursue a higher education leading to an academic degree. There are several ways that members and the general public can support this very worthy cause. The Connecticut State Police Academy Alumni Educational Foundation, Inc. operates a store located at the Leo J. Mulcahy Complex, 294 Colony Street in Meriden. 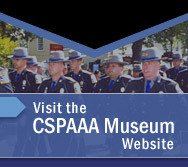 This store carries a variety of Connecticut State Police memorabilia including apparel and accessories for the entire family. For anyone who is unable to make it to the store in Meriden, you can visit the online store to browse through merchandise and make a purchase. All proceeds from purchases at the store go directly the the CSPAAEF scholarship fund. Private donations are always accepted and greatly appreciated. To make a tax-deductible donation to the Connecticut State Police Academy Alumni Educational Foundation, please contact us. Also, please check out the Events section of this website for upcoming CSPAAA and CSPAAEF fundraising events that are open to the general public.